We love having the family around during the holidays. These fun turkey legs are a great recipe the kids would love to make. After your big holiday dinner, let the kids make these easy turkey legs. No baking needed, and they taste great too! The holidays are coming quickly, and that means a lot of parties and get togethers. It is such a fun time of year. Chocolate Caramel Turkey Legs will be a hit at your next big gathering. 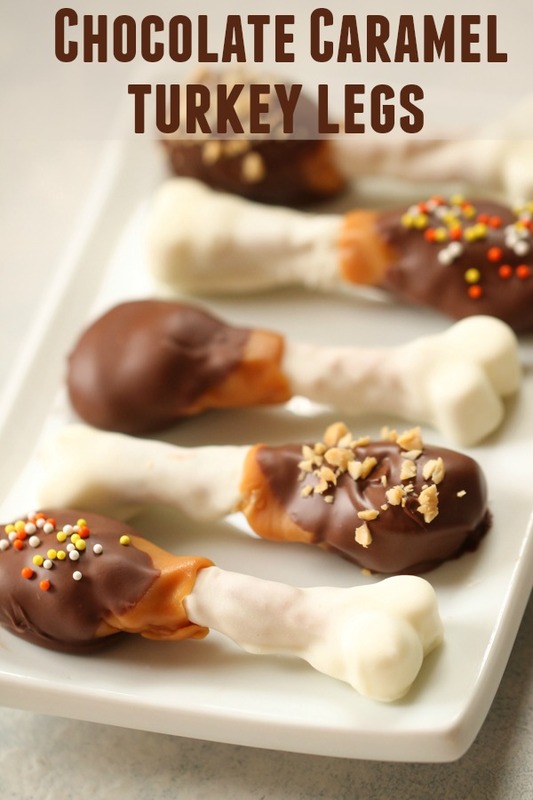 For your next party, gather the kids around to make these Chocolate Caramel Turkey Legs. They are a great craft/snack that the kids will enjoy. It’s a fun twist on a chocolate caramel pretzel rod. We like to have a planned activity for the kids on Thanksgiving day. Turkey legs would be an ideal craft to make, and a delicious treat to eat. We love the taste of the salty pretzel rod, along with the sweetness of the chocolate and caramel. It’s the perfect blend of savory and sweet. Do you have to use pretzel rods? We used a 3 inch twisted pretzel rod when making these turkey legs. It was a sturdy pretzel that held up when we tapped the excess chocolate off. You could also use the longer pretzel rods and cut them in half. You want the total length of the pretzel to be about 2 1/2 – 3 inches long. 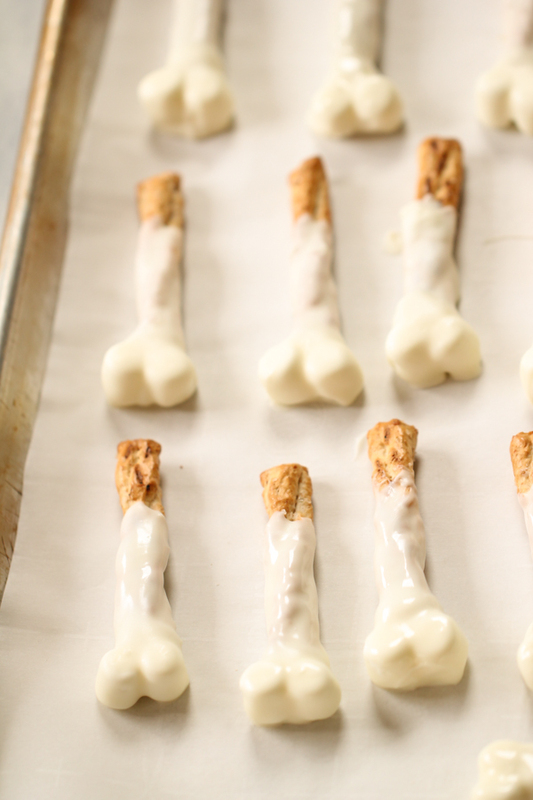 The skinny pretzel sticks will not hold up well in this recipe. They are too skinny and will break easily. Use a thicker pretzel like the pretzel rods. 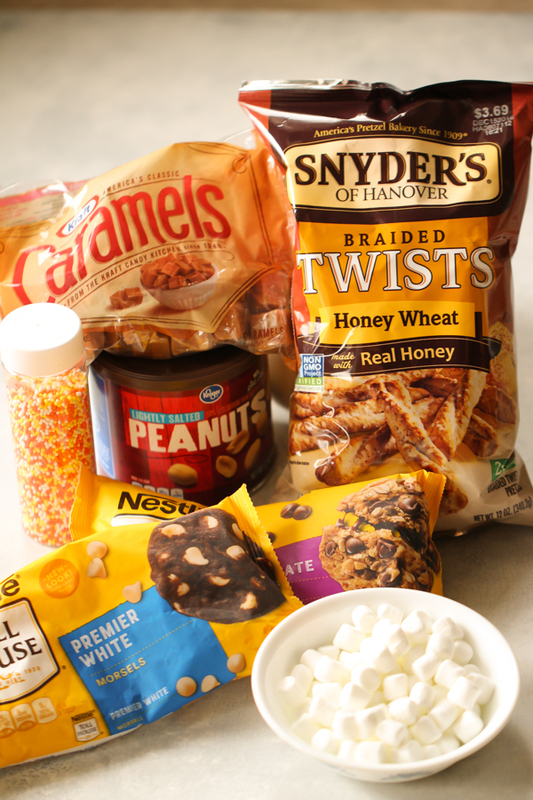 We used milk chocolate chips and white chocolate baking chips in this recipes. The white chips covered the pretzel rod. The chocolate chips were used to cover the caramel on each turkey leg. 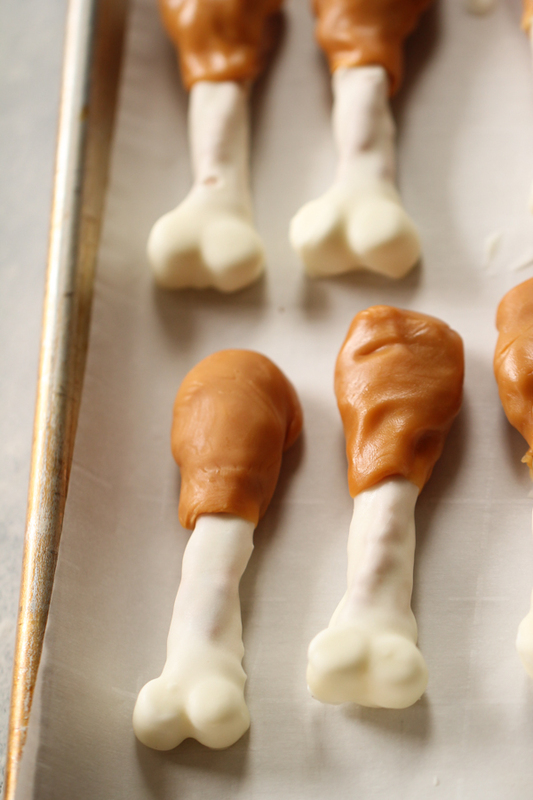 You could use chocolate candy coating or bark for these turkey legs. It comes in chocolate and vanilla. We use the packaged chocolate chips because we like the taste of them better than the candy coating. So it’s a personal preference, but both of them work great on these chocolate caramel turkey legs. There are a few steps involved in making chocolate caramel turkey legs, but each step doesn’t take long at all. So stick with us and you’ll have the cutest dessert for your holiday party. Chocolate Caramel Turkey Legs don’t require a lot of ingredients. You may have some of these ingredients already in your kitchen. Melt 1/3 cup of the white chips in a small glass bowl in the microwave. Stirring every 20 seconds until melted and smooth. Dip the tip of the pretzel rod in the white chocolate and stick 2 mini marshmallows on the end. Lay it down on a baking sheet lined with parchment paper. 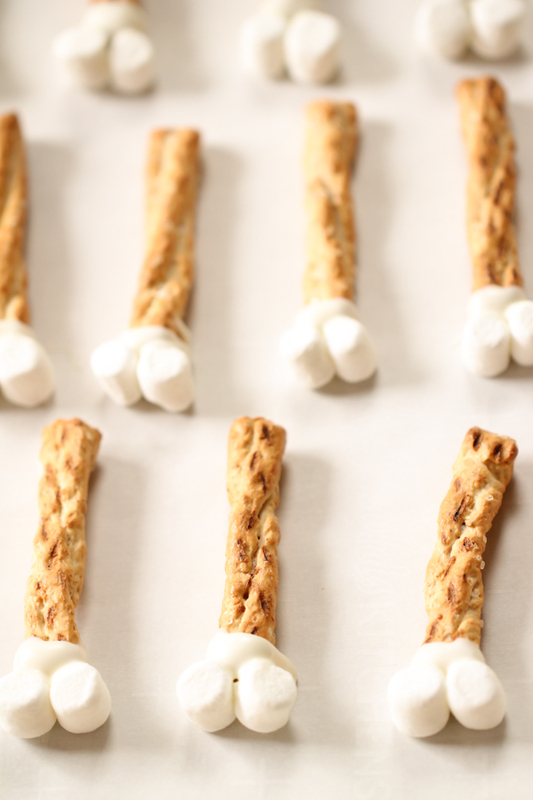 Be sure that the marshmallow are pushed up against the pretzel rod after you lay them on the baking sheet. Place them in the freezer for about 5 minutes to set up. Melt the rest of the white chips in a bigger microwave safe bowl. Cook and stir every 20 seconds until the chocolate is smooth and all chocolate chips have been melted. After the marshmallows have set up well, dip the rest of the rod in the white chocolate, tapping off any excess. Dip it within an inch from the top. You’ll want to cover the marshmallows again so that it all blends together. Place them right back on the same baking sheet with the same parchment paper. Place back in the fridge for about 5 minutes to set up. Unwrap the caramels. Each turkey leg needs about 2 caramels each. Heat them for about 10 seconds in the microwave until barely soft. Mold the caramels around the top part of the turkey leg, leaving it a little thicker at the very top to resemble a turkey leg. After wrapping the caramel around each one, place them back on the same baking sheet. I found it easiest to soften the caramels 2 at a time in the microwave for about 10 seconds. If you soften all of the caramels at once, they will harden up before you get to all of them. Melt the milk chocolate in a microwave safe bowl, stirring about every 20 seconds until all melted and smooth. Dip the caramel end of the turkey leg into the chocolate, covering most of the caramel. It’s fine if some of the caramel is showing. Place them back on the parchment lined baking sheet. You can leave them plain, or add sprinkles and chopped peanuts. Let them set up for about 10 minutes, and then they are ready to eat. Baking Sheet – This is one of our favorite baking/cookie sheets. They are very sturdy. Parchment Paper – We use parchment paper for baking cookies and whenever we don’t want recipes to stick. Glass Measuring Cup – We use this as another mixing bowl. It’s great for melting chocolate chips in the microwave. Rocking Knife – You’ll love this rocking chopper knife that is also great as a pizza cutter. Great for chopping nuts. 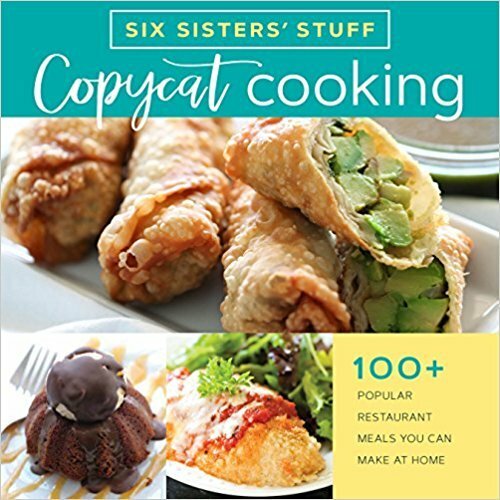 SIX SISTERS’ STUFF COPYCAT COOKING —– CLICK HERE TO ORDER! In a small bowl microwave 1/3 cup of white chips until melted. Stirring every 20 seconds until smooth. 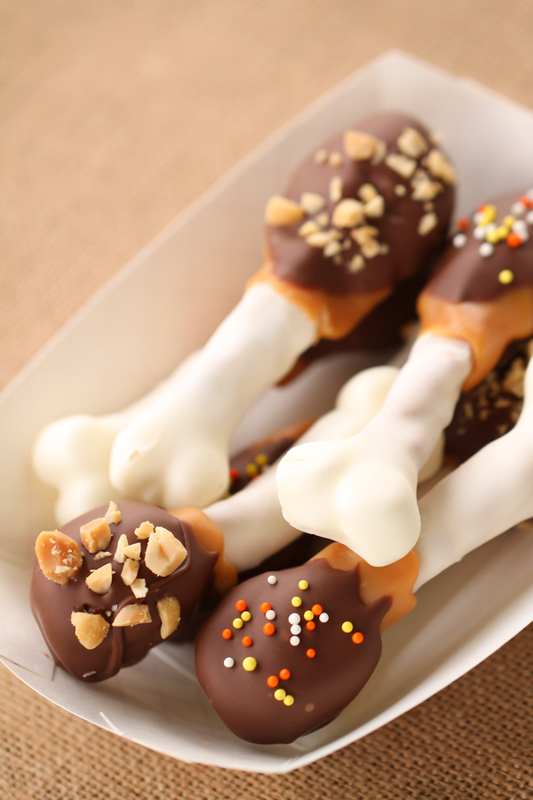 Dip the tip of each pretzel rod into the melted white chocolate and stick 2 mini marshmallows onto the melted chocolate. Place on the baking sheet. Refrigerate for 5 minutes or until the white chocolate sets up. Place the remaining white chips in a microwave safe bowl and melt them in the microwave. Stirring every 20 seconds until melted and smooth. Dip the marshmallow end of the turkey leg into the white chocolate. I found it easier to spoon the white chocolate around the pretzel rod. Leave about 3/4 inch at the end that is not covered in white chocolate. Be sure to tap off any excess chocolate so you will have enough to do all of your turkey legs. Place them back onto the same parchment lined baking sheet. Refrigerate for another 5 minutes. Soften 2 caramels in the microwave for about 10-12 seconds just until soft. Mold 2 caramels around the end of the turkey leg that has not yet been dipped in chocolate. Place back onto baking sheet after you do each leg with caramel. Melt the milk chocolate chips in a microwave safe bowl, stirring every 20 seconds until melted and smooth. Dip the caramel end of each turkey leg in the melted milk chocolate and tap off the excess chocolate. Place back onto the parchment lined baking sheet and sprinkle with chopped nuts, sprinkles, or leave it plain. Let the turkey legs set up for about 10 minutes and then they are ready to serve. Check out this recipe for birthday cake truffles. So easy for kids to make.